Translated from French by Beti Ellerson and published on the African Women in Cinema Blog in collaboration with Africine.org. Falila Gbadamassi is a writer at Africiné Magazine. (Images: Cannes). 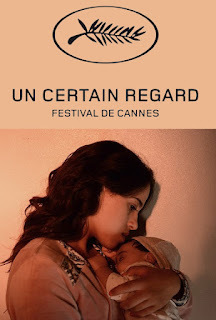 Sofia, the first feature film by Franco-Moroccan Meryem Benm'Barek screened on 16 May 2018 at Un Certain Regard, is a social drama set in a society holding on to backward beliefs. The young filmmaker delivers a polished work presenting a superb portrait of a woman, brilliantly performed by Maha Alemi. Sofia (Maha Alemi) is a clever 20-year-old who discovers that she is pregnant and is about to give birth. In Morocco, to have a child outside of marriage is a crime. Hence, assisted by her cousin Lena (Sarah Pearls), the young woman has a few hours to find the father of her child, a certain Omar (Hamza Khafif). Sofia is clearly not very expressive. In addition, she is almost scolded for not being more expansive when she drags her entire family into this "experiment", considered particularly humiliating in Moroccan society. Especially when her cousin Lena, who comes to her rescue from the very start of the drama, asks her to light her lantern. Though Sofia has problems, it does not automatically elicit empathy. And one of Meryem Benm'Barek's remarkable magic tricks is to make her, scene by scene, a woman who ends up commanding respect and admiration. Sofia’s main charcter is a heroine in a world of women, as her mother, aunt and cousin are the main protagonists. On the other hand, the men (Sofia's father and the father of her child), contrary to appearances, are accessories, even if they can also cause irreparable harm. Sofia's stoicism is the most visible facet of her heroism. Her denial that she is pregnant, the rejection and anger of her parents, her new motherhood, all are hardships that she seems to traverse with indifference. Her face, filmed in close-up, is almost always impassive. But when she does smiles, it is to show, and perhaps especially to affirm, that despite the circumstances, she remains in control of her destiny. Particularly in a society that oppresses women and leaves them, as a result, little or no room for maneuver. A lesson in feminism, without fanfare. Meryem Benm'Barek created a scenario of exceptional finesse and intelligence. And she was able as well, to transform it into images with the same qualities. Maha Alemi, who carries the film, is also a wonderful discovery. This perfectly-mastered first work, is again, proof of the vitality of Moroccan cinema. Sofia, le premier long métrage de la Franco-Marocaine Meryem Benm'Barek projeté le 16 mai 2018 à Un Certain Regard, est un drame social dont le décor est une société aux principes encore rétrogrades. La jeune cinéaste livre une œuvre épurée au service d'un somptueux portrait de femme, interprété avec brio par Maha Alemi.